A perfect sample from City Tap House. Our dedication to burgers knows no bounds. That is why at the height of the afternoon heat on Sunday, we arrived at an uncovered parking lot at Xfinity LIVE! amidst an AccuWeather RealFeel of 97 degrees to sample as many burgers as we could comfortably fit at the 5th annual Burger Brawl in support of literacy in Philadelphia schools. With sweat soaking our shirts—for once from the heat and not the amount of grilled meat we were stuffing into ourselves—we began our hungry crawl through the event that ended surprisingly early. 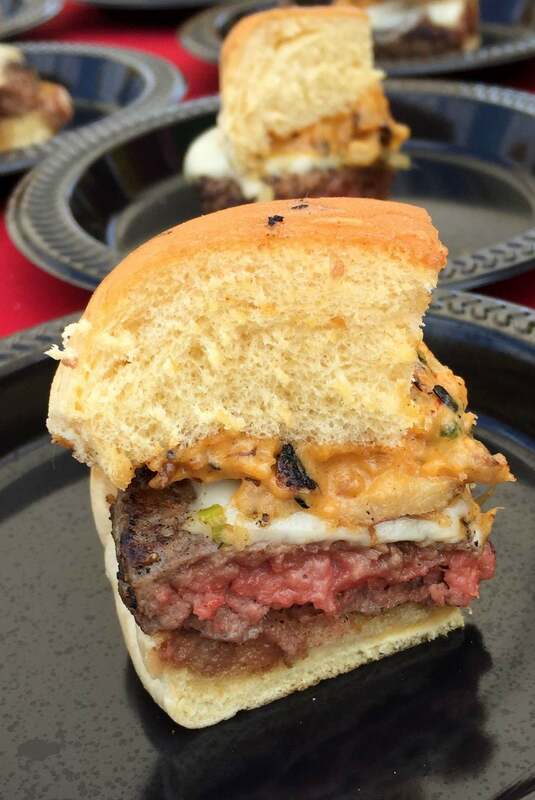 With 60 vendors serving burgers, this was the first food event in which we felt like total failures. While the samples ranged between burgers cut into quarters and small sliders, there is only so much burger and bun one can fit before filling up. Eating the offerings from four restaurants was roughly the same as a full-sized burger, and you can only go so far after that, especially in the oppressive heat (kudos to the organizers for having free ice-cold water for everyone). And while we are in no way complaining about the size and selection of the event, there would be no way to even come close to trying all of the burgers on offer. The ones we did try, though, did not disappoint. Aldine’s shishito pepper relish was one of the best toppings available, and the duck and beef patty from Blue Duck (who ended up winning People’s Choice), was a perfect blend. 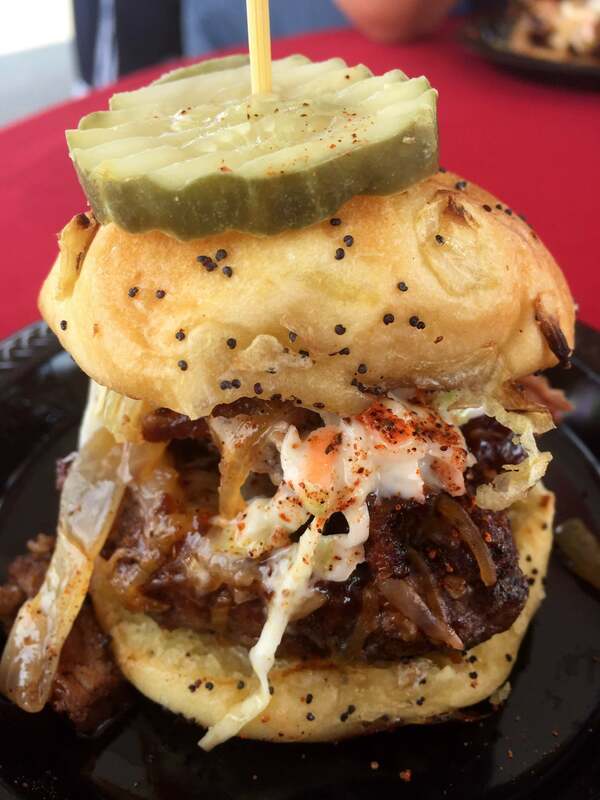 Some of the other favorites of the few burgers we were able to try were the burger from Paesano’s, topped with pastrami and fried onions, as well as the Memphis Mauler from Fat Jack’s BBQ, which was topped with sweet BBQ pulled pork and a crisp pickle chip. Lo Spiedo’s burger, which sounds tame with just a brisket patty, cheese, onion, bacon, lettuce and tomato, was perfectly made. Good Dog’s Good Dog Burger, stuffed with Roquefort and topped with onions, is a classic and one of the city’s best burgers. The Memphis Mauler from Fat Jack’s BBQ: patty, pulled pork, slaw, onions, pickle. We coaxed ourselves to about 10 samples during the VIP hour, but after that we hit a wall with not only the amount of food we’d eaten, but also the heat. As the thousands of general admission attendees began to swarm in to the event space, we beat a hasty retreat. With merely a sixth of the burgers tasted, we felt defeated, but ultimately satisfied. Looking through the book of burgers afterwards, it was a little disappointing to read about all the great-sounding offerings we never got a chance to try—especially the Frenchy Burger from Village Whiskey (sauce au poivre, black truffle aioli, cabernet grilled onions and gruyere), which ended up getting the judge’s vote for best in show. And while there is no way to push through to try even a majority of the burgers, the event makes sure to keep the tickets reasonably priced so you never feel like you got ripped off. If someone spent $60 on a ticket, it would be easy to feel like you had spent too much for too little, but for $35, nothing was out of hand. The chefs in attendance take the competition very seriously, so no one shows up with anything sub-par. And despite the heat, which is hopefully not as intense next year, the event is a must-attend for anyone who loves burgers. This entry was posted on June 16, 2015 by Ryan in Burgers, Events and tagged blue duck, burger, burger brawl, philly, village whiskey, xfinity live.